It was now time for the last stage of the IPSSSDR. The stage would start in Mountain View, WY and finish in Utah, near Evanston, WY. This stage would be all on wide groomed trail for 40 miles. All the dogs were looking good and feeling very excited, so I decided to run 12 dogs. At the last minute I decided to run 11, and leave Quil behind because he was a little sore in one of his shoulders when I checked everyone over before the race start. My team would be Bella and McGee in lead, Emmett and Jasper in swing, Super Cub, DiNozzo, Khufu, Cessena, and Embry in team, and Kaycee and Ziva in wheel. When we hooked the dogs up, they were pumped. 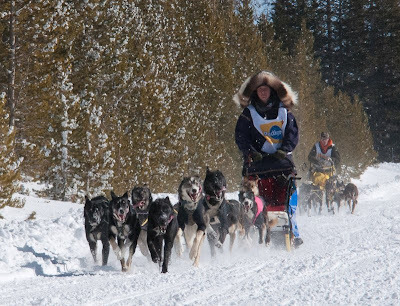 It is a good thing that I had Dad ride the sled and brake while I led the team up to the start because even he had a hard time stopping them. I was excited that the dogs were so amped at the end of a long race like this, but also concerned about how much power I was going to have strapped in front of me. 3...2...1... and we were off, the last stretch of the IPSSSDR zipping by as the team thundered down the trail. The trail was great, and we dropped in elevation a little bit out of the start before steadily climbing for a while. It was great to do some climbing, which is what my team is great at. I remember the team charging up one of these climbs with some other mushers around us having to pedal to keep moving steadily up the hill. I remember when Bruce M. caught me at the top of one of these climbs after chasing me up the hill, and he told me jokingly to work a little harder because it was making him feel bad! I didn't really need to though, the dogs were going faster than I could pedal and I don't usually pedal, so if I try, the jerkiness of it annoys them. I can ski pole to help them, but I did not bring my pole with me, which was ok since I never needed it. With all this climbing, we were eventually going to have to start going down. I don't enjoy down hills that much because I have to ride the brake so much to keep the dogs at a safe speed. We came to a section of trail with some down hill switch backs that one of the mushers had warned me about. The dogs weren't tired at all and found the increase of "kill Jenny potential" even more exciting. I made it around the first couple switch backs, but tipped the sled over on the next. The trail was so hard and fast that the dogs kept going and sped around the next switch back with me holding onto the sled. The sled and I swung out into the powder off the groomed trail on the outside of that switch back and the handle bar slipped out from under my hands. It was the worst feeling in the world, and was like my hands just let go even though I was telling them to hold on. 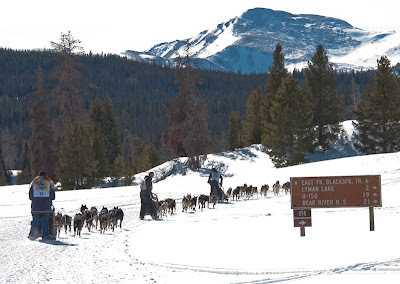 I scrambled to my feet and chased after the sled as the dogs pulled it away down the trail. I began running as the team disappered around the next switch back at a terrible velocity. Nothing in the world is worse than being separtated from your team, there are no words to describe how scarred and empty I felt. Fortunately, Warren Palfrey showed up soon behind me with his team and gave me a lift down the trail. I was so releived to see that one of the snow hooks and set into the trail and the team was stopped. I could see some of the dogs were tangled and ran up to make sure no one was tangled around the neck or something bad like that. The dogs were all fine and Warren had stopped his team to wait for me to get the dogs going again. I had to untangle the lines on the sled because they were all twisted from the sled rolling who knows how many times as the dogs pulled it down the trail before setting off again. I am so grateful for what Warren did and grateful that I am in a sport where everyone would have done the same thing if they were in that position. There was one last switch back to go around, and we made it around ok, though a little faster than I felt comfortable at that point. The rest of the trail was downhill into the finish, but it was relatively straight, so the dogs were less excited and I was able to slow them down easier. We came in across the finish line behind a group of teams, so I had to stop and wait, instead of just cruising in on to the truck. When I got the dogs stopped they immediately began barking and lunging into their harnesses to go more, even though they had just gone 40 miles today and around 300 miles in the race leading up to this point! We then moved along to the truck, where Dad, Sydney, and I cared for the team and fed them before putting them back in the trailer to rest. I ended up placing just out of the top 10, in 11th place, but didn't mind at all since I had all my dogs safe with me at the finish. Once all the teams were off the trail, we were going to do the Junior IPSSSDR. Every year, elementary through middle school students are assigned to each IPSSSDR musher to run in the junior race at the end of the race. Both the musher and their junior would run a team over a short course. My junior musher Dani, was already experienced in mushing from previous years of doing the junior race, so I let her start out driving the team with me riding in the basket. We ran Alice and Super Cub in lead, followed by Quil, Paul, and Ra. About half way through our 3 mile course, I had Dani stop, and I rode on the runners with her so I could help steer the sled. Once we got back to the truck, I showed her how we cared for the dogs after a run and let her give each of the dogs their cookies and do their tricks. All my dogs do some combination of shaking your hand, sitting, laying down, or speaking before they can get their cookie. After a long and hard day, we went to the finishing awards banquet. I was feeling wiped out, but getting a good hot meal helped me wake up a little more... oh and that soda I had with the caffeine probably helped too. The banquet cam and went as pictures were shown and the top 10 overall finishers were individually introduced on stage. Even though I would have loved to place in the top 10, I was a little bit relieved that I didn't have to make a speech in front of the huge crowd that had gathered for the ceremony. After all was done, we headed to our last host family to spend the night before driving back home. After a long string of days, the race was over and it had all gone by so fast. I had a great time and all the mushers were so nice and friendly. It was also such a pleasure to visit all these small communities who come out and support the race and offer their hospitality to us mushers and our handlers. And I have to admit, it was nice to do many miles on the back of the sled but still be able to sleep in a warm bed every night instead of in the sled! I hope to do this race again, hopefully next year, as I had a wonderful time. The dogs also had a blast, but none as much as Super Cub. I couldn't post this update without mentioning Super Cub who was being insane the whole race. He was convinced that we were going to race every day for the rest of his life, and he thought that was AWESOME! The only day he was not being a total spaz, was the Big Piney stage when I told him that he needed to take a day off even if he didn't feel like he needed to. He was a little mad at me that day because he knew that a lot of the other dogs got to go and he didn't.